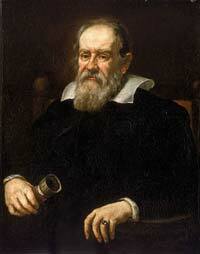 Galileo Galilei was born on February 15 1564, in Pisa, Italy. When he was 17 years old, his parents sent him to the University at Pisa to pursue medicine. While he was in a service in the cathedral one day, he was distracted by a bronze lamp hanging from the ceiling. He noticed that the lamp was drawn aside so as to light the room better. When it was released, the lamp oscillated back and forward gradually with decreasing amplitude. Galileo used the pulse of his heart to keep the time and was surprised to discover the lamp’s oscillation period was unaffected by the arc’s size of oscillation. He later proved through an experiment that the period taken by a swinging pendulum did not depend on the bob’s weight. He proved that the period is dependent only on the pendulum’s length. The pendulum was what formed his interest in astronomy and science. When he later got the chance to attend a lecture in geometry, this further fueled his interest in astronomy. Galileo then changed from medicine and decided to study science, philosophy, and mathematics. These were subjects in which he believed he possessed a strong natural talent. In 1589, Galileo was appointed the mathematics professor at Pisa. In 1591, his father, Vincenzo Galilei, died and as the eldest son, Galileo had to take up the position of the bread winner. Since he was not well paid as the mathematics professor, he looked for a much better post. In 1952, Galileo become the mathematics professor at the University of Padua. He was able to secure a job with a salary that was almost three times more than the one he received at Pisa. He held this position until 1610 and described this period as the happiest time of his life. He focused on a number of experiments, such as the speed of fall of various objects, the pendulum effect, and mechanics. In 1609, Galileo heard of the telescope invention in Holland. Having not seen the telescope, he made a superior version which he used to make many astronomical discoveries. He was able to discover that there were valleys and mountains on the moon’s surface. He could track sunspots, observe the planet Venus and its phases, and even see that Jupiter had four large moons. His discoveries made him popular and he was later appointed to the court mathematician of Florence. In 1614, Galileo was accused of heresy because he supported the infamous Copernican theory which stated that the sun was the central part of the solar system. This went against what the Catholic Church said, which was that the earth was the center of the universe. In 1616, the church went so far as to forbid him from teaching or pursuing such theories. In 1632, Galileo was condemned of heresy after he published his book Dialogue-Concerning-the-Two Chief World Systems. In his book, he used a dialogue between two men to argue facts that were in support and against the Copernican theory. Galileo was called to present himself before the Inquisition at Rome where he was convicted and sentenced to a life of imprisonment. The sentence was later minimized to permanent house arrest in his home in Arcetri after being forced to publically withdraw his views and beliefs of the discredited Copernican theory. By 1638, he was starting to lose his eyesight, but he still continued writing. He published a book called Discourses Concerning Two New Sciences which included his ideas on motion laws and principles of mechanics. Galileo died in his home in Arcetri on January 8, 1642.